Do you have young children in the budding artist phase? You know the one where they draw countless pictures everyday and each one represents a special piece of their soul materialized on paper. Countless scribbles drawn with pencils and crayons that sometimes don’t stay on the paper. Then there are the stickers. They are fun and bright and colorful and glittery and sometimes bedazzled. They come in all shapes, sizes, symbols and characters. 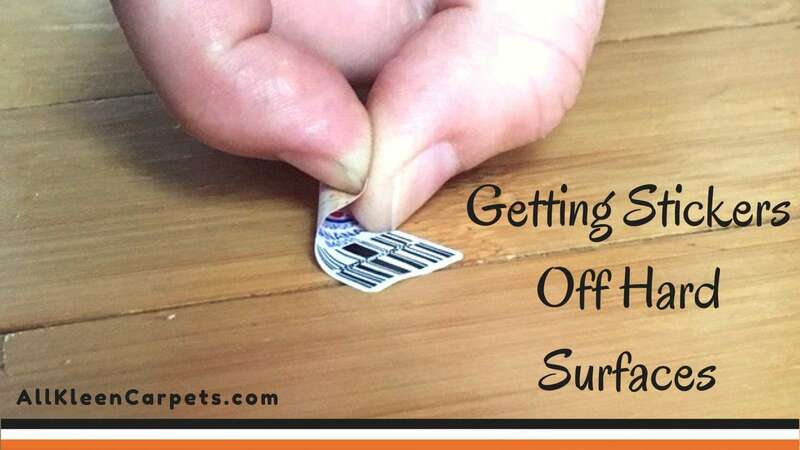 They are so fun that your kids don’t just want to stop at sticking them on paper, they stick them everywhere including your nice hard surface floors. When they get stuck on the floor they can be hard to remove. Do not fret, if you have sticky residue that just won’t budge from your hardwood, tile, natural stone, etc. We have compiled a list of sticky solvents to help get your floors goo free. Rubbing Alcohol- said to be the best, cheapest, and most effective at removing stubborn adhesive. Just soak the sticker in alcohol for a few minutes and gently scrape the sticker away with a blunt object. Be careful where you use this though as it can be too harsh for some surfaces such as natural stones. Hand Sanitizer- hand sanitizers work on sticky adhesives for the same reason they sanitize hands. You guessed it, for the rubbing alcohol in them. Vinegar- this is another great natural and low-cost way to dissolve sticky glue from hard floors. Use the same method as with the rubbing alcohol, but it will take a little more elbow grease. Be careful on hardwood floors and surfaces with sealants and finishes. You may want to test an unseen area first to be sure it will not ruin the finish. Vegetable Oil- this is a good solution for goo on natural stone that has been sealed. Simply apply ordinary household vegetable oil used for cooking to the floor and gently rub away with a clean unused paper towel. Once the glue is dissolved, get some gentle liquid dish soap, the kind used for hand washing dishes, and wash the oil away. Eucalyptus Oil- this is a good natural alternative to use and it smells good too. Of course, make sure to test a small area before applying directly to your sticky situation and create an even stickier one. Pencil Eraser- peal as much of the sticker up as possible and simply rub the remaining sticky residue with a common pencil eraser followed by a damp cloth. Baby Oil- this is great for non-porous hard surfaces such as tile. Apply directly to the residue and wipe with a clean cloth, you should have clean tile in no time. Peanut Butter- this is good to use on wood surfaces without damaging the wood, just be sure to clean the peanut butter up right after getting the sticky goo removed. Steam- this is a good way to sort of “melt” down the glue from stickers, but don’t use this method on hardwoods. Steam is a no go for a hardwood floor. Simply soften glue then gently scrape with a blunt edge. For more great hard surface floor cleaning tips and tricks feel free to browse our website. For the best care of your carpet, upholstery, and tile in Snohomish County and North Seattle make an appointment with All Kleen.